HABITUS is a global real estate, design development group, specializing in hospitality, residential, retail and commercial developments with offices in Denmark, Dubai, Hong Kong, the Philippines, Singapore, and Vietnam. Along with Third Culture Music + Media, we created a clean, modern website that celebrates the company's large array of completed projects and what they hope to accomplish in the future. A suite of event collaterals were designed for PwC Australia's Annual Chef's Dinner. Guest chef, Josue Lopez lead a select group on a culinary journey through Australia's vast ecological landscape, presenting a menu that explores tastes and textures influenced by both modern and native Australia. Sydney's CBRE City Sales team commissioned a template for their LinkedIn marketing campaigns. St Vincent's Health Australia is Australia's largest Catholic not-for-profit health and aged care provider. 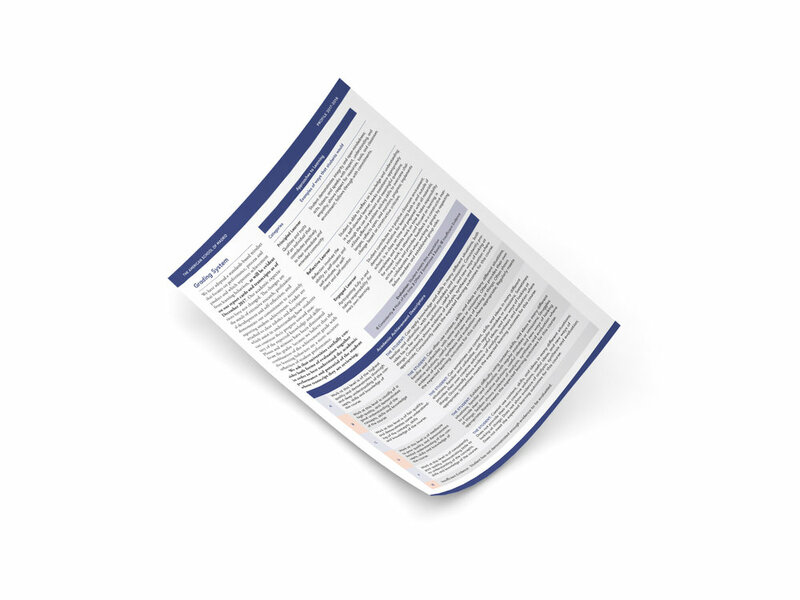 Contracted for a day, the task was to stylize and format a corporate document and create a headers and footer. Esquire Philippines was dedicated to defining what exactly “Man at His Best” means—in particular, to the Philippines. 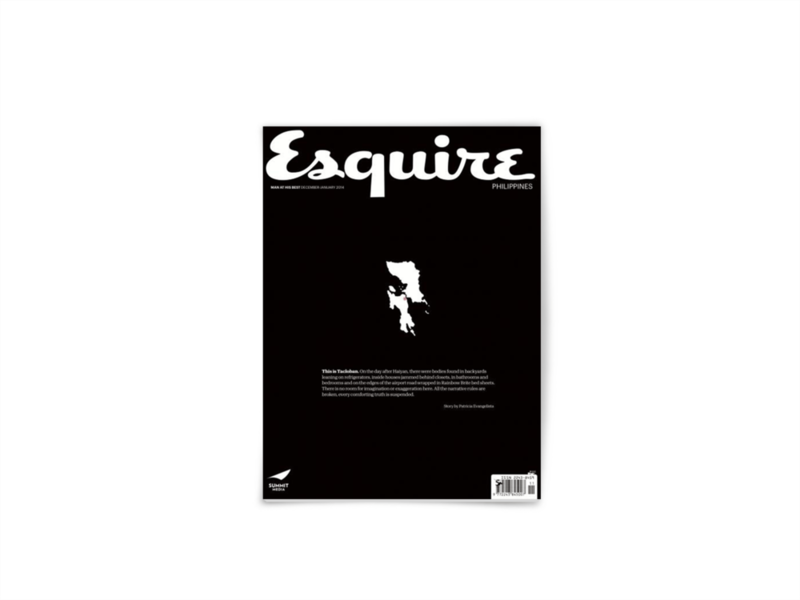 With its thought-provoking covers and intelligent prose, Esquire wants to be memorable and talked about. This was its way of distinguishing itself in the marketplace. 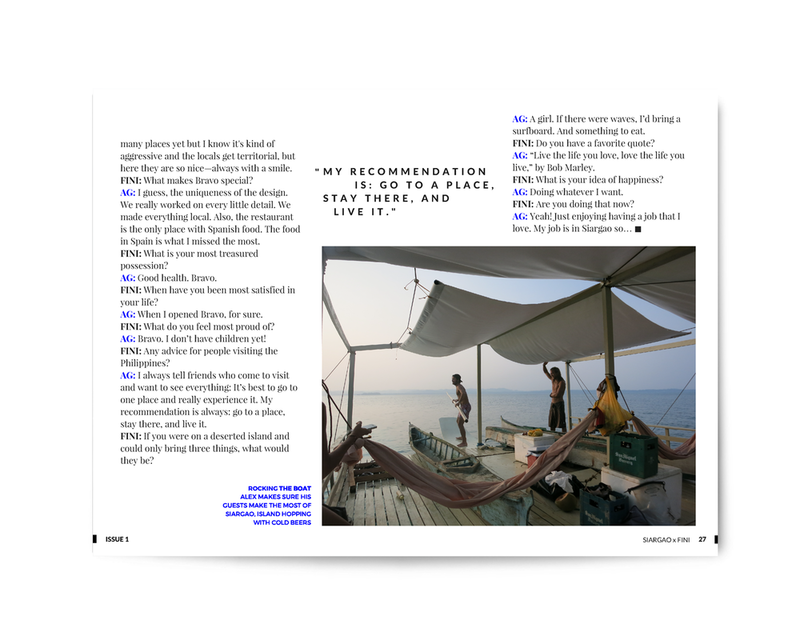 With compelling content that can only be found in Esquire and executed in the best ways possible, whether through long-form essays, visual stories, guides, or profiles, Esquire’s features are universal but still current, and always on the pulse of culture. Esquire Philippines is dedicated to defining what exactly “Man at His Best” means—in particular, to the Philippines. 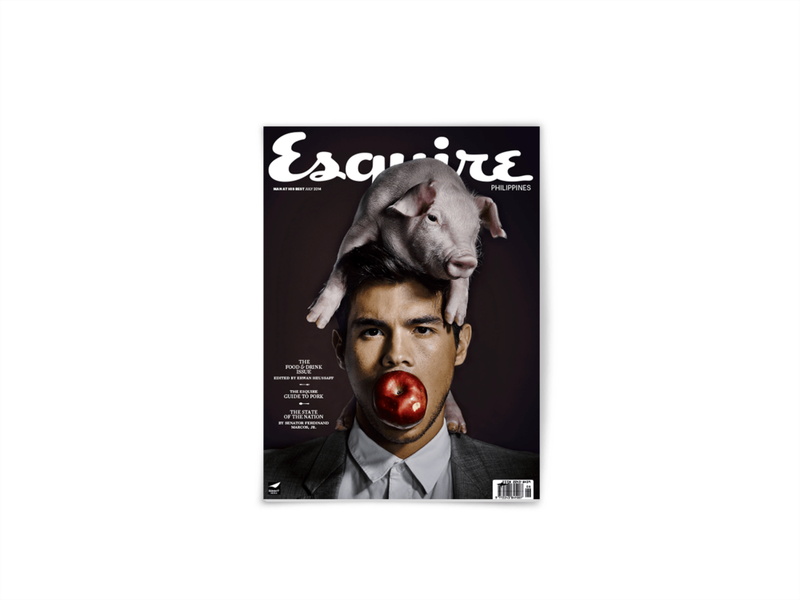 With its thought-provoking covers and intelligent prose, Esquire wants to be memorable and talked about. This is its way of distinguishing itself in the marketplace. 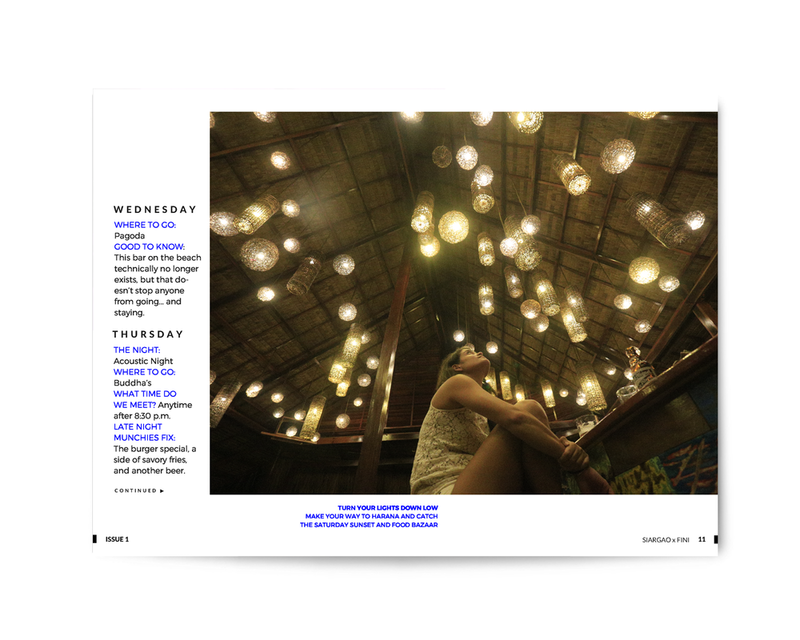 With compelling content that can only be found in Esquire and executed in the best ways possible, whether through long-form essays, visual stories, guides, or profiles, Esquire’s features are universal but still current, and always on the pulse of culture. 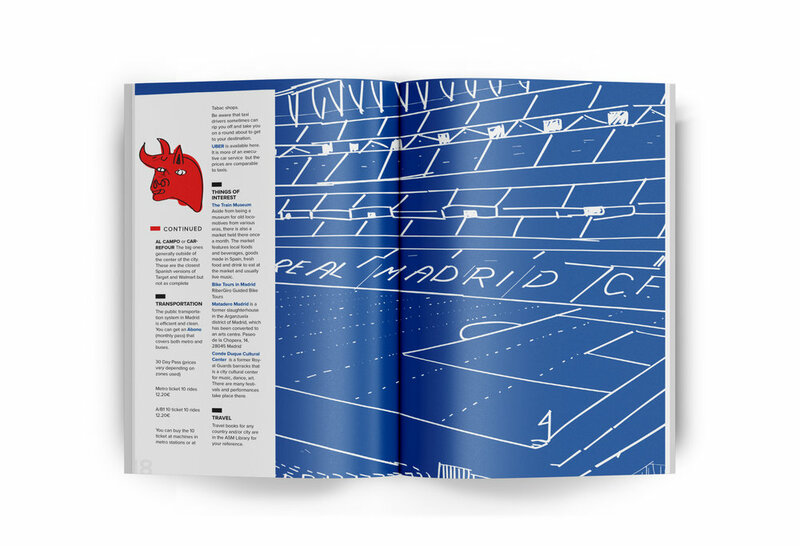 The American School of Madrid commissioned a revamped end-of-the-year magazine, ASM Today, for the ASM community. 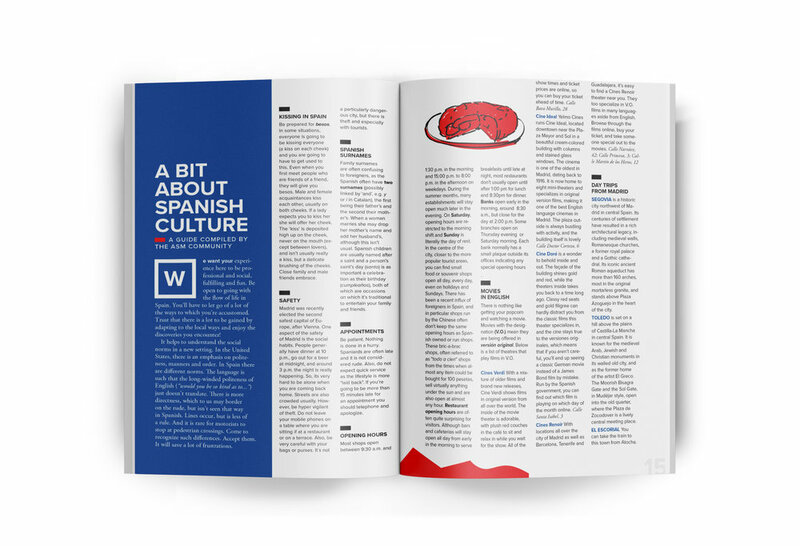 The magazine's theme revolved around progressive learning and the academic journey the educators, administrators, and students have experienced throughout the year. 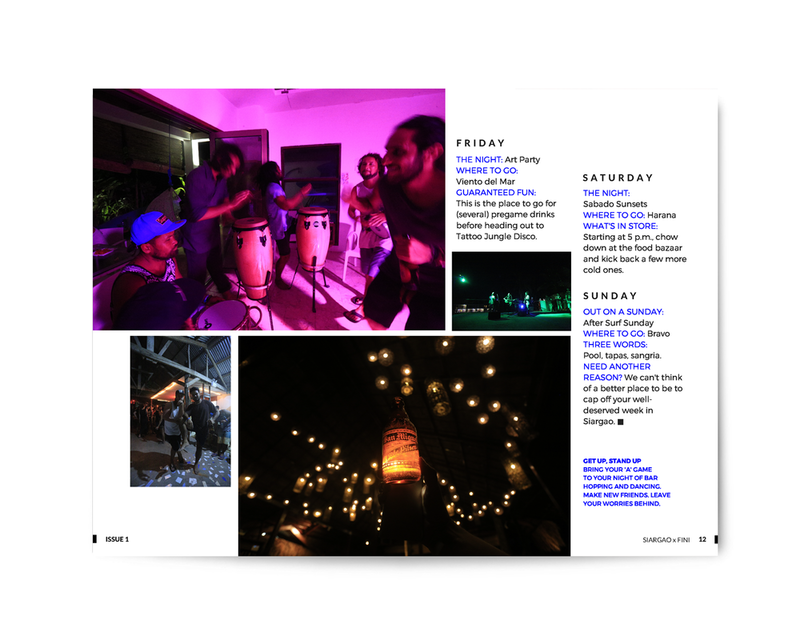 The publication celebrates the dynamic, energetic atmosphere. The new look draws inspiration from the new campus renovations and colourful school materials which playfully compliment the crowdsourced contents of the magazine. 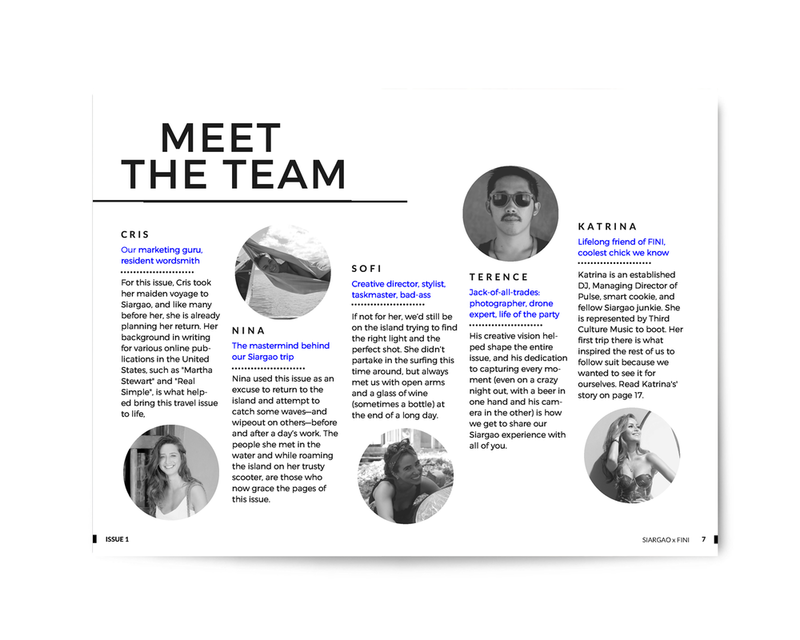 The American School of Madrid wanted to create a 4-page profile on their school to use in both print and digital educational resources in the United States. 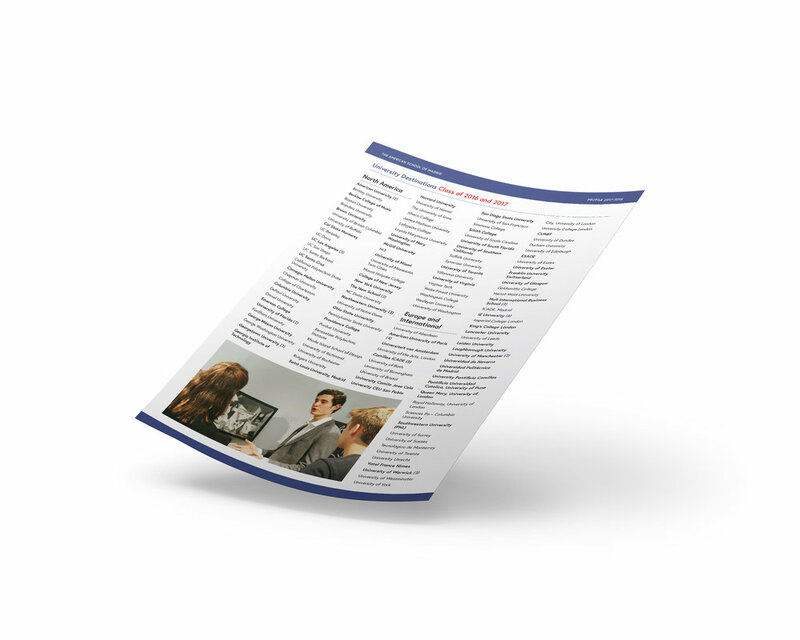 The profile contains information regarding their esteemed institution including statistics, graduation information, key people, and curriculum details. 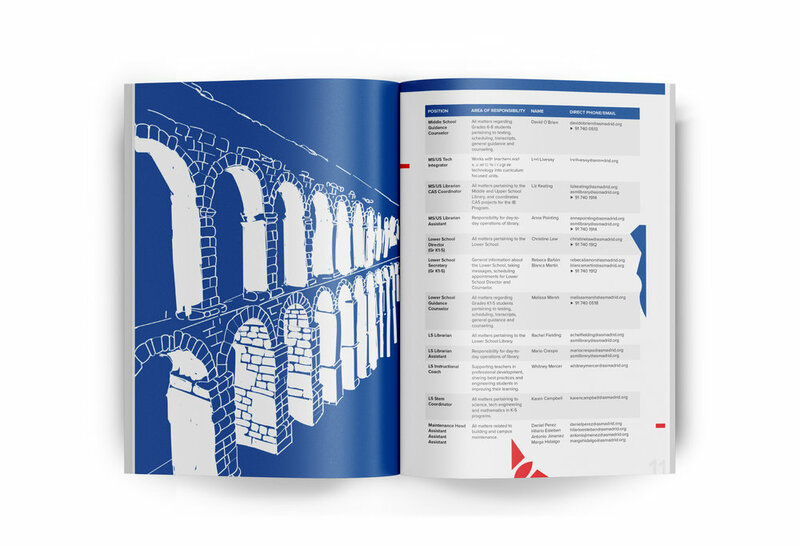 The American School of Madrid commissioned a revamped handbook for new faculty and staff as part of the welcoming package upon arrival in Madrid. 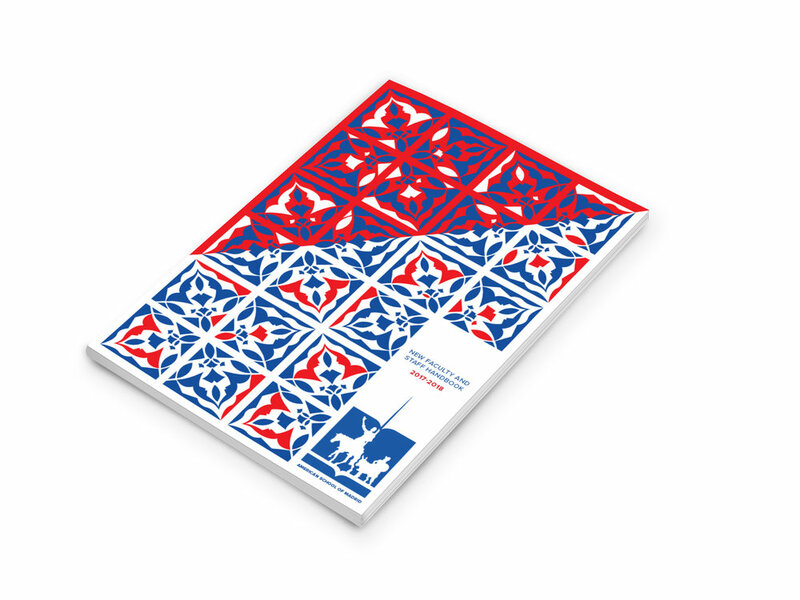 The soft-cover handbook features a custom Spanish tile-inspired pattern created using parts of the school logo. 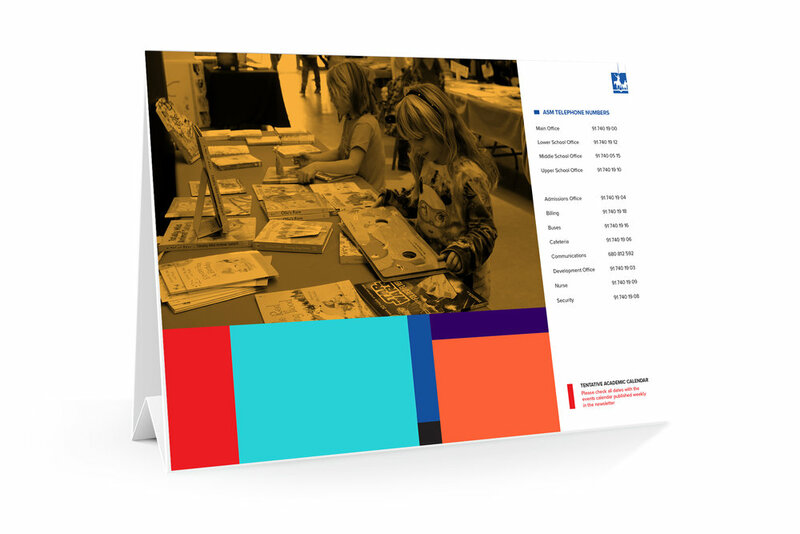 The same cover was used for the Upper, Middle, and Lower School Student Handbooks '17-'18. The American School of Madrid commissioned a re-energized academic calendar for new for the upcoming 2017-2018 school year. Using the same colour palette as ASM Today , the calendar's modular design is intended to compliment and counter the bubbly end of the year magazine. The rectangular shapes take inspiration from the large window panes which allow the bright Spanish sunlight pour into the new Learning Commons and Library. Bravo Beach Resort is a boutique, lifestyle resort in Siargao Island, Philippines. This publication is a welcome book for guests for both in-room and for purchase. Engkanto Brewery is positioned to deliver to Filipinos an obtainable craft beer that is brewed with high-quality and natural ingredients. For this series, illustrations were created for an 8-week long social media marketing campaign with the intent to create brand awareness. The goal of the campaign is also to provide consumers with the concept of the brand which is grounded in Philippine folklore. Zilch is the fourth studio album of the legendary Filipino rock band, Pupil, and band's first album released through MCA Music LLC. The album features raw, rock-and-roll sounds that perfectly reflects the matte printed photographs by noted photographer Tim Serrano. The album musical concept was a collaboration between Erwin Romulo and Jason Tan. Zilch had been nominated for The Awit Awards—a music awards in the Philippines given annually by the Philippine Association of the Record Industry to recognize the outstanding achievements in the music industry—for the "Album Packaging Excellence Award" category for "Best Album Package". Making Matisse is an Art education company which provides private tutoring, instructed sessions, and mentoring for students of all ages. 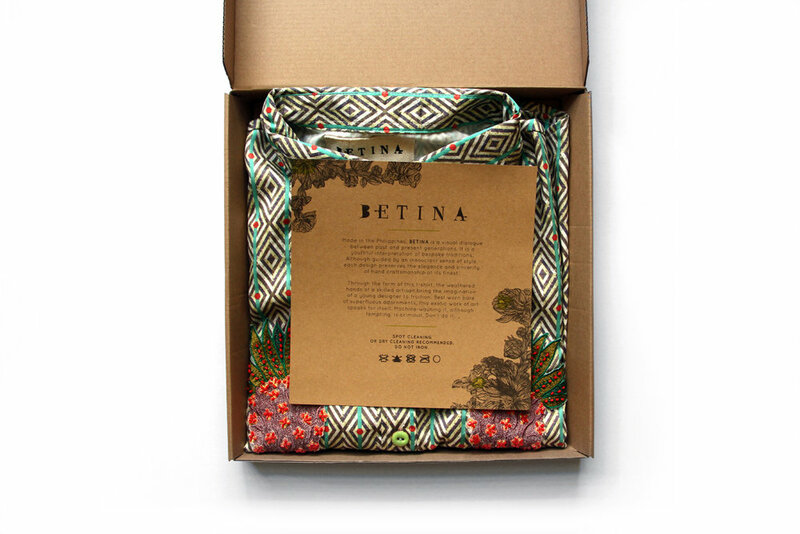 A collaboration with the talented Betina Ocampo for her eponymous artisanal clothing line, BETINA. Together we developed two pieces with custom printed fabric, hand-embellished details, and botanical illustrations-turned-embroidery. Collaged plants, silky pajamas, and bold colours—hoorah! FINI was born out of the desire to foster local talent, revive fading traditions, and improve business practices in the Philippines. 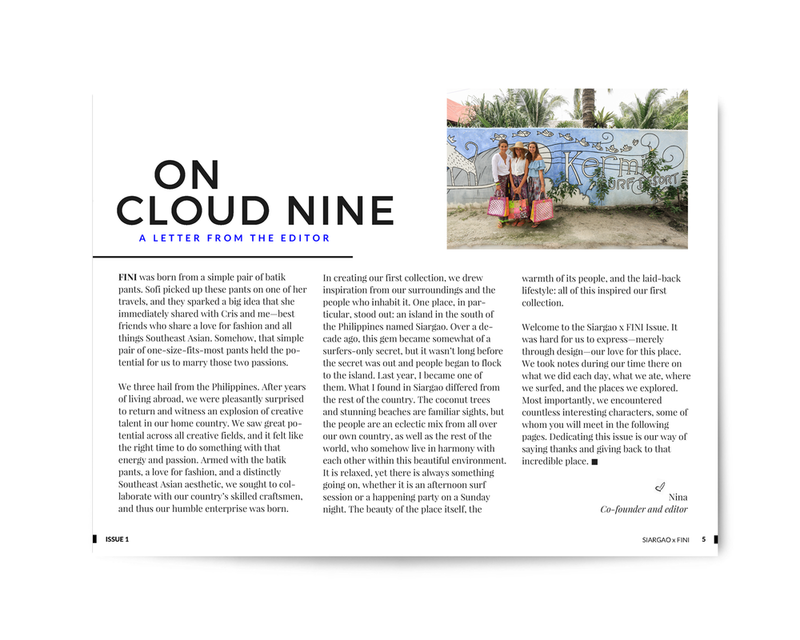 FINI builds partnerships with local communities and they dedicate a fixed portion of all the proceeds to different Philippine charities in need. 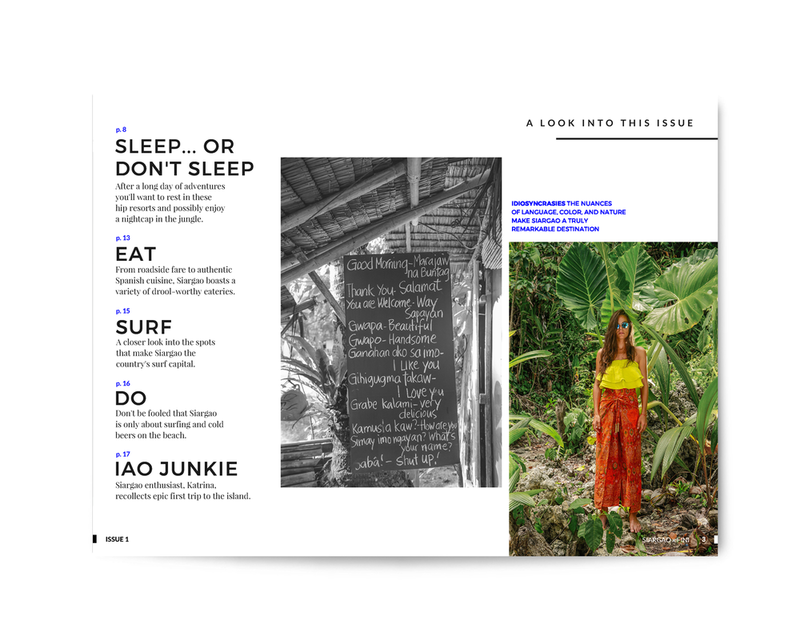 Issue 1 celebrates the first capsule collection inspired by Siargao Island. 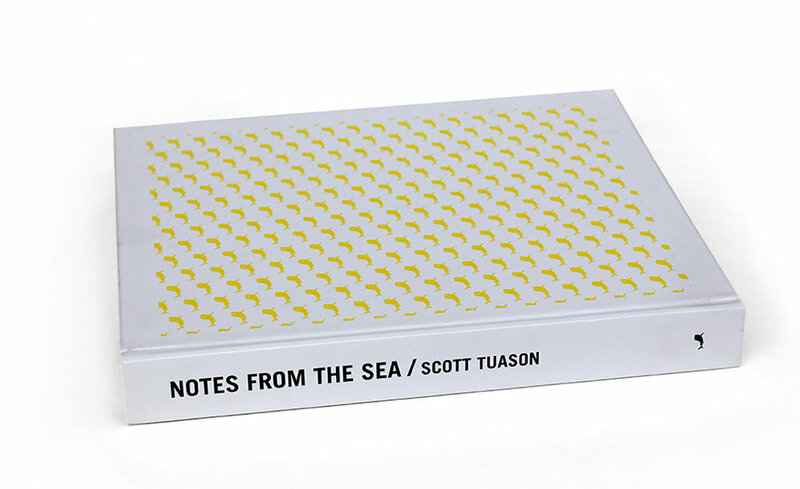 Notes From the Sea by Scott Tuason spans nearly a decade of underwater photographs taken in reefs around the world. Punctuating the images of fantastic coral gardens, shifty sharks, curious blennies and all the other colourful characters that reside in the sea are a handful of salt-crusted stories that Scott Tuason brings back from his adventures plumbing the oceans depths. Short, amusing and to-the-point rather than laden with heavy prose, the anecdotes give a glimpse into the mind of a serious diver, one with a skewed sense of humour and a penchant for attracting deadly animals. A bright travel guide for a tropical, destination wedding. The bride has familial roots in the Philippines and wanted to share the couples joy for her home country with their guests.